Our IWC-3-2 internal wire clip set includes two internal wire clips that are designed to secure our PVS-IS3 and PVS-RS3 vent screens inside of any standard 3″ PVC hub or coupling. 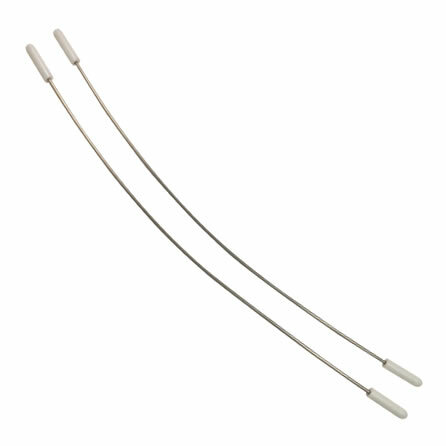 Each internal wire clip is made from 304 stainless steel and includes high temperature silicone caps on each end. By utilizing these internal wire clips, which may be reused for many years, no drilling or adhesives are needed to secure our 3″ PVS series vent screens in place and remain serviceable. The IWC-3-2 internal wire clip set includes two internal wire clips that are designed to secure our PVS-IS3 3″ insect vent screens and PVS-RS3 3″ rodent vent screens into any standard 3″ DWV PVC hub or coupling with an inside diameter of 3.500″. These internal wire clips not only make installation of our 3″ PVS series vent screens simple, without the need to use drills or adhesives, but they also allow our vent screens to be easily serviced or changed as seasonal threats to ventilation systems change. All of our internal wire clips are made out of American grade 304 stainless steel (there is a difference in quality) and include high temperature silicone tips that cover each end of the clip. These IWC-3-2 internal wire clips are designed to provide years of use, even when removed for seasonal vent screen changes, and also resist corrosion to avoid unsightly rust stains that are common with inferior materials. Though our 3″ internal wire clips are commonly used to secure our three inch vent screens into high efficiency boiler, furnace and hot water heater vent terminations (both intake and exhaust), there are many other applications where these fasteners are used. Additional applications include those in the aquatics industry, pools, radon systems among many others. Every PVS-IS3 and PVS-RS3 we sell ships with a single IWC-3 internal wire clip, which is sufficient to hold the vent screen securely in place even when they are directed straight down. Therefore, only purchase the IWC-3-2 internal wire clip set if you want to have spares on hand, need to replace the included wire clip(s) that were provided with your initial vent screen order or if you want to double up the internal wire clips to increase the holding power twofold.